They have an intense, almost magical sweet scent when they blossom at night. is a perennial plant related to the agaves, extracts of which are used as a middle note in perfumery. The common name derives from the Latin tuberosa, meaning swollen or tuberous in reference to its root system. It consists of about 12 species. Polianthes means "many flowers" in Greek language. The tuberose is a night-blooming plant thought to be native to Mexico along with every other species of Polianthes. It grows in elongated spikes up to 45 cm (18 in) long that produce clusters of fragrant waxy white flowers that bloom from the bottom towards the top of the spike. It has long, bright green leaves clustered at the base of the plant and smaller, clasping leaves along the stem. Members of the closely related genus Manfreda are often called "tuberoses". 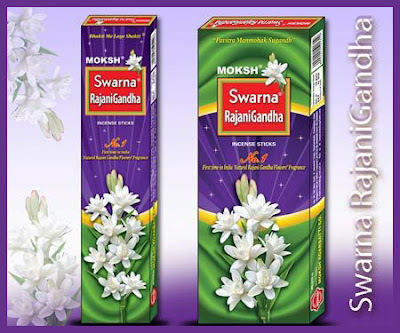 An exquisite range of Ganga Jamuna Rajnigandha Incense sticks are offered by us to our clients. These fascinating and premium incense sticks are made from high quality raw material and natural fragrances. 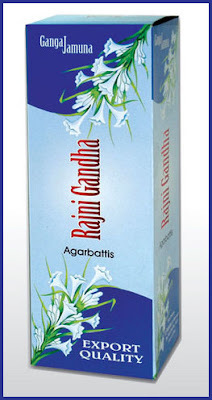 Our product will create the appealing environs of garden in abode and office by spreading the real aroma of fresh rajnigandha through rajnigandha incense sticks. CLICK for more samples of incense.